Meanwhile, in 10-inch skillet, melt butter over medium heat. Add brown sugar; beat with whisk until melted and well blended. Beat in water until smooth. Remove from heat. Cover; set aside until biscuits are baked. To serve, add banana slices to sauce; cook about 2 minutes or until bananas are tender. Split each warm biscuit; place on individual serving plate. 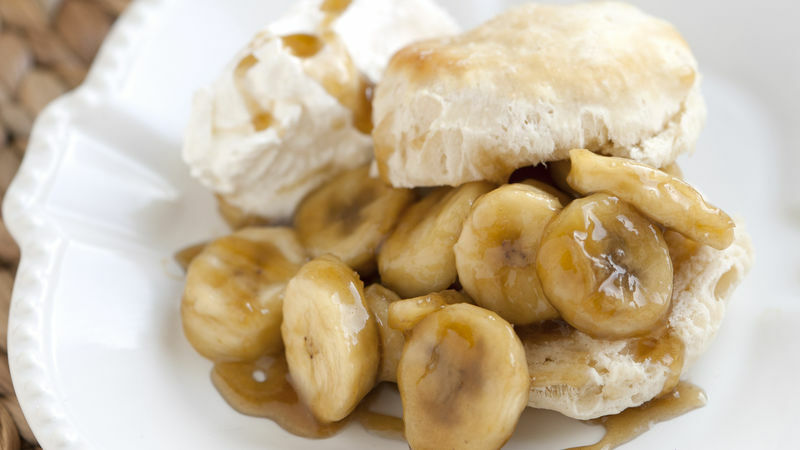 Spoon bananas with sauce onto bottom halves of biscuits. Top with whipped topping. Cover with top halves of biscuits. Drizzle with extra sauce. Replace bananas with ripe, sliced peaches for a twist. Forgo the biscuit and replace with vanilla ice cream for a bananas Foster sundae!